The Fellowship was fortunate enough to obtain a copy of SPACE CRUSADERS #1 from Atomic Pulp Comics. The stories are written and lettered Christopher Mills; with art by Peter Grau and Nik Poliwko, and colors by Matt Webb. 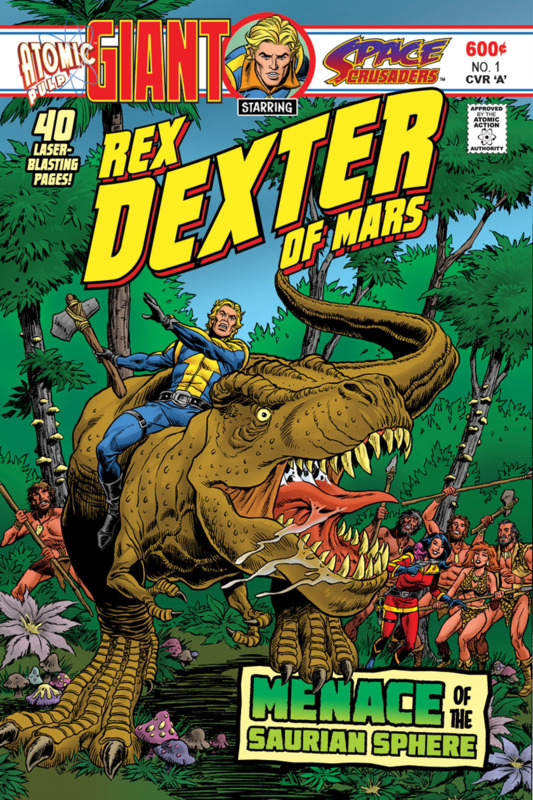 “Menace of the Saurian Sphere!” – Rex Dexter and Cynde are called on by the Earth Astral Command to stop a metal planetoid that is on a collision course. Can our heroes evert the planet’s destruction in time? What mysteries and danger awaits them on the sphere? “The Voltese Icon” – Lance Lewis is a down on his luck detective residing on Port Nedor Station, which itself has seen better days. His luck may be changing as his gets a new client. This new client’s story is so unbelievable, but could it be true? Atomic Pulp is a new publisher that’s goal is to bring back the vibe of the Silver and Bronze Age of comics. If SPACE CRUSADERS is any indication, mission accomplished. Both tales invoke sci-fi tales told back in the 50’s and 60’s. The Rex Dexter story is action packed, while the Lance Lewis tale is a slow burn mystery. Peter Grau’s art takes me back to some of the 70’s art, while Nik Poliwko seems to have captured the late 50’s art style and incorporating today’s style as well. Overall a great book to read over and over again. SPACE CRUSADERS #1 is available only at www.indyplanet.us. To find out more about Atomic Pulp, check out www.atomicpulp.com.